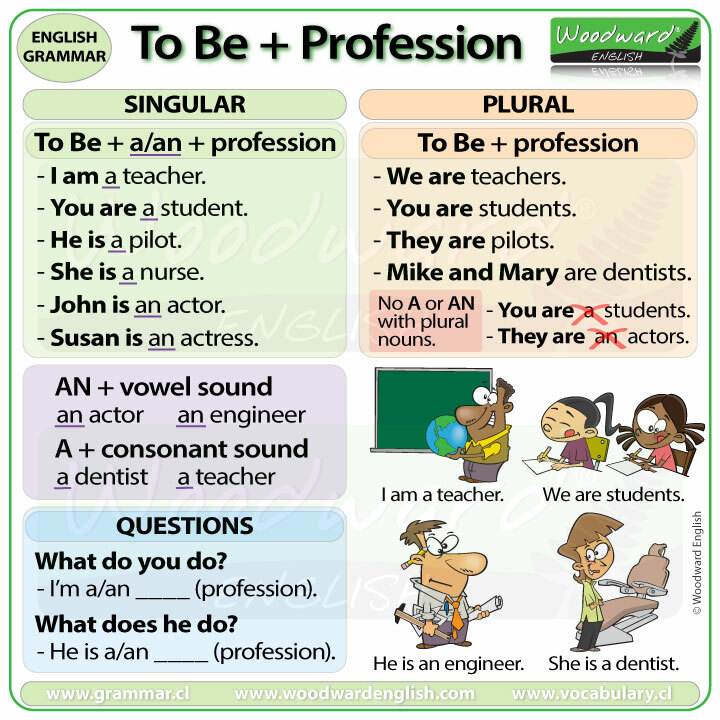 To say your profession or occupation in English you use TO BE. It is important to put the article A or AN before the profession when we are talking about one person. If there is more than one person, we do not use A or An. Jack and Jill are engineers. The first sentence refers to ONE student… YOU! So we need the article A before the profession/occupation. The second sentence refers to YOU plural = you + you + you. Since there is more than one YOU, we don’t use A or AN and the occupation (student) is in plural too. What does + person + do? What do you do? – I am a scientist. What does Mike do? – He is a police officer. What does Angelica do? – She is an engineer. What does your father do? – He is a mechanic.